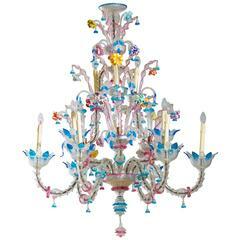 Rezzonico style is one of the oldest chandelier made in Murano. The peculiarity of Rezzonico is the composition. Each arm is composed by pieces of glass that are going to dial the chandelier - These elements are called "bosses" and are totally custom made in terms of colors . Each Bosses in totally handamade 6+3 lights, total black with red and amber decoration. Measures: Height 115cm Diameter 90 cm. Wave Murano Glass is the new start-up born on the Murano island. Founded in 2017, the company quickly drew attention on the market for its products originality and its capacity to create new shapes and concepts with an old material. Wave Murano Glass distinguishes itself by having in charge of the company a Glass Master and Chief of production who’s also a physicist. It’s Roberto Beltrami, the first under-30 talent of the island who, along with a small team of glass-blowers and bevellers, offers made-to-measure collection, vase, lighting fixture, unique and exclusive furniture on the market. Scientific, technical and artistic skills make of Roberto Beltrami an experienced and reliable person differentiating him from other Murano island masters. Wave Murano Glass experiments all creative possibilities that glass can offers satisfying any type of request of customization from clients. Flexibility, research, movement and change are part of the company philosophy and are reflected in the related offers. Renowned luxury brands have already put their trust in Wave Murano Glass. The design and production team are dedicated to customized projects in the entire world and is able to turn any habitual request from architects and designers into a unique and finished product. Any “dream” can be realized in glass. A modern sculpture portraying the soul of a glass man. Core of black glass with 24-karat gold leaf Sommerso with clear glass. A modern artistic acquatic turtle sculpture . Handmade in Murano. A modern Murano glass sculpture portraying an epic hand . Dark Amber with blue Sphere. 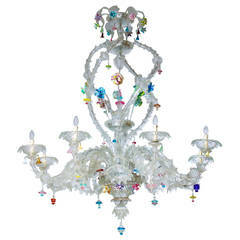 Old chandelier Murano Rezzonico in glass. Electrified. 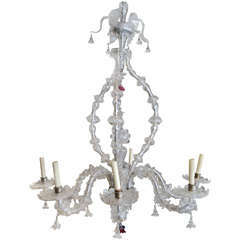 1920s Venetian Ca' Rezzonico chandelier.